Alexander Gorlizki is an up-and-coming artist, known for paintings that superimpose fanciful images over traditional Indian designs. His work has been displayed at the Victoria & Albert Museum in London, the Denver Art Museum and Toronto's Royal Ontario Museum, among others, and sells for up to $10,000. Mr. Gorlizki lives in New York City. The paintings are done by seven artists who work for him in Jaipur, India. "I prefer not to be involved in actually painting," says Mr. Gorlizki, who adds that it would take him 20 years to develop the skills of his chief Indian painter, Riyaz Uddin. "It liberates me not being encumbered by the technical proficiency," he says. It's a phenomenon that's rarely discussed in the art world: The new work on a gallery wall wasn't necessarily painted by the artist who signed it. Some well-known artists, such as Damien Hirst and Jeff Koons, openly employ small armies of assistants to do their paintings and sculptures. Others hire help more quietly. Art-market insiders say soaring prices and demand for contemporary art is spurring the use of apprentices by more artists. The art world is divided on the practice: While some collectors and dealers put a premium on paintings and sculptures executed by an artist's own hand, others say that assistants are a necessity in the contemporary market. "An artist has a choice to make," says Mark Moore, owner of Mark Moore Gallery in Santa Monica, Calif. "They either hire assistants or they risk not being able to meet their obligations to their dealers. Then the art market, which is fickle and sensitive, gets the impression that the artist has disappeared from the art world." Mr. Koons says he has 150 people on his payroll and that he himself never wields a paintbrush. "If I had to be doing this myself, I wouldn't even be able to finish one painting a year," he says. Every year his studio averages 10 paintings and 10 sculptures. In the last four years, six of his works offered at auction have sold for prices between $11 million and $25 million each. "More and more, [using assistants] is becoming common practice, partly because artists want to keep up with demand and partly because it's just more widely accepted now," says Adam Sheffer, a partner at New York gallery Cheim & Read. He says that five of the 30 artists represented by his gallery use studio assistants, including conceptual artist Ghada Amer, known for stitching figures and words across canvases and furniture, and photographer Jack Pierson, who uses found objects in his work. The fact that they use assistants is immediately disclosed by the gallery if a collector asks, Mr. Sheffer says, and "hasn't affected the marketability of their work one bit." For some artists, hiring assistants can be a liability. Earlier this year, Pace, a major New York gallery, turned down several sculptures by 83-year-old John Chamberlain, because they were made by a Belgian fabricator under Mr. Chamberlain's supervision, rather than by the sculptor himself. Mr. Chamberlain, whose metal car parts twisted into abstract bundles often sell for more than $1 million, switched galleries. Collectors often expect the use of assistants in fields like conceptual and video art, where the idea, rather than the execution, is key to the work's value, Mr. Sheffer says. For painters, it's a trickier proposition. "All the painters in our gallery paint their works from beginning to end—Pat Steir, Jonathan Lasker—and I think their collectors like the notion that every ounce of paint on their works was brushed on by the artists alone. It matters," he says. Beth Rudin DeWoody, a major Florida collector of contemporary art, agrees. "Part of the reason I like to buy drawings is that they're usually done by the artist alone," she says. "I know that even younger artists use assistants now. I understand they need help if the work is complicated, but the truth is I really cherish things more if the artists made the work by themselves." She says she never asks whether an artist had assistance when she purchases a work. For Michael Hort and his wife Susan, who collect contemporary art in New York, the use of assistants is a deal-breaker. "We like to see the artist's hand in the work we buy, though we don't always know for sure that that's what we're getting," he says. Mr. Hort says he values the tiny imperfections in an artist's brushstrokes, and when he notices that the work is looking "too perfect," he suspects an assistant is involved. At that point, the Horts walk away. He recalls one painter who took Mr. Hort and his wife to lunch while assistants labored away in his studio. The Horts declined to buy anything from him. By the time Pop art came into fashion in the mid-20th century and Andy Warhol began cranking out silkscreens and lithographs with the help of workers at his well-publicized Factory, opinion began to swing back the other way. "The value of a work of art is not invested in the hand that made it, but in the intention and the realization," says Robert Storr, dean of Yale University's School of Art. Adam Lindemann, who collects works by Mr. Koons and Swiss installation artist Urs Fischer, doesn't object to the use of assistants at all. An artist like Mr. Hirst or Mr. Koons is "designing the work not executing it, in the way an architect designs a building but doesn't necessarily lay the bricks," he says. There were no raised eyebrows last year when the Albright-Knox Art Gallery, a museum in Buffalo, N.Y., dedicated a 2,200 square foot "scribble drawing" by Sol LeWitt. 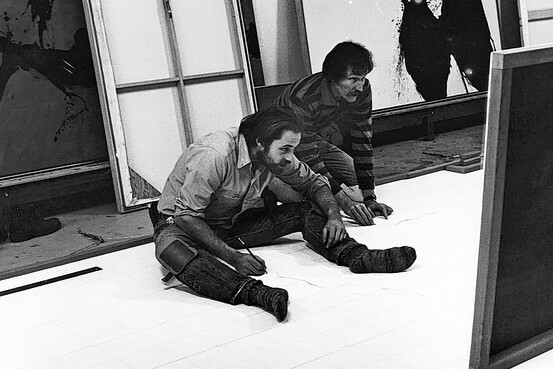 The drawing was started last August, three years after Mr. LeWitt's death. Sixteen artists, including five from Mr. LeWitt's studio, did the work; the other 11 were artists and art students recruited by the museum. "It was not about Sol's hand," says John Hogan, who had been an assistant to Mr. LeWitt and worked on the Albright-Knox drawing. "It was about the thought processes in creating the work. He worked closely with us, so we knew what his intentions were." Angela de la Cruz suffered a stroke five years ago and can no longer paint. That didn't keep her from being nominated for the prestigious Turner Prize last year, for her brightly colored canvases—now painted entirely by assistants—which are twisted and contorted by their broken wooden frames. "It's all about trust," says Ms. de la Cruz. "I give them instructions and they get on with it. It's about them understanding my language and my practice. The assistants do what I would do myself." The 46-year-old Ms. de la Cruz says that she first communicates her ideas by email to her assistants—she employs three or four, depending on the amount of work, plus a studio manager—and then talks directly to them, "which sometimes can be complicated as I have a speech impediment." There's no uniform job description for an artist's assistant. Some work a day or two a week for several months, others are employed full-time for years. While pay is rarely high—former assistants say $20 to $25 an hour is typical—some get medical insurance and other benefits. A spokeswoman for Mr. Koons's studio says that his assistants are provided with health insurance, for instance. Some former assistants, now well established as artists, decline to have assistants of their own. Ben Weiner, who worked for a year for Mr. Koons in 2003, says he won't use assistants even though the gallery that represents him is clamoring for more of his art to satisfy a backlog of potential buyers. "I don't think there's anyone who could do my painting as well as I can," he says. "I have ideas of how I want my paintings to look that I can't put into words. When people see my paintings, I want them to see marks that I actually made." Rachel Howard, who spent four years as an assistant to Mr. Hirst, says she "can't think of anything worse" than having an assistant herself. She notes that "I only paint for my own needs, not to fulfill anyone else's." Ms. Howard says she was Mr. Hirst's assistant starting in 1992, after they met while standing at a bus stop and started talking about art. "It taught me to know my worth and not be afraid to think big," she says. Mr. Hirst declined to be interviewed. John E. Scofield looks back fondly on his three years as an assistant to the late abstract artist Robert Motherwell, but he says he wouldn't use an assistant himself for his paintings. "That's so deeply personal, you can't," he says. Mr. Scofield's hand, along with that of another assistant named Bob Bigelow, contributed to one of the most famous paintings in America, Motherwell's "Reconciliation Elegy," a huge canvas that hangs on permanent display in the National Gallery in Washington, D.C. The two assistants filled in the large black blotches in the painting that Mr. Motherwell had outlined. Then Mr. Motherwell "pretty much reworked every square inch of what we did," Mr. Scofield recounts. The practice can be a godsend for struggling young artists. Carl Fudge, who worked nine years for Kiki Smith, the sculptor, print maker and installation artist, was one such beneficiary. "Leaving graduate school with an art degree doesn't set you up," he says. "You have to look for other means to make a living." Ms. Smith says she looks upon her assistants as family members and mentors them in their own projects: "I take their lives as seriously as I take mine." At the other end of the spectrum is Mr. Koons, who runs his vast, high-ceilinged studio with an efficiency that discourages personal interactions. Everyone has an assigned task, from painting a section of a canvas by following elaborate diagrams to mixing dozens of paints to produce exactly the right color. Large paintings are lifted up a wall by electric hoists; in one room on a recent afternoon, two painters worked silently on a canvas at floor level while two others painted the upper part from a scaffold. There's a hierarchy of supervisors, including a studio manager, a painting supervisor and several assistant managers. It brings to mind an assembly line, but the 56-year-old Mr. Koons, who is married to one of his former assistants, bridles at the analogy of a factory. "People get misconceptions that it's about production, like a machine," he states. "But I've thought for a year about almost everything before starting to make it." Mr. Koons, whose use of assistants is widely known, says he supervises the work intently: "I'm here Monday through Friday and I try to travel as little as possible. The paintings are as if I made every mark myself." Mr. Koons says he doesn't mentor his artist employees, and they don't bring paintings into the studio to show him. "This is about production of the work," he says. "I want them to stay focused on the work here." Mr. Gorlizki, who employs the artists in India, has a harder time with supervision. He uses a courier service, shipping paintings back and forth to New York so that he can make suggestions, and once or twice a year he visits India. 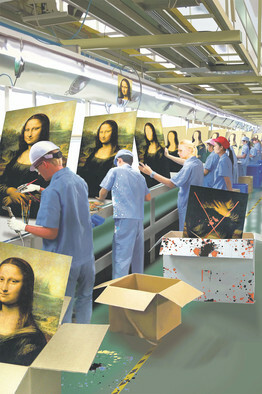 Because this process is so time-onsuming, a painting often takes two or three years to complete. But Mr. Gorlizki, who talks openly about his use of assistants and puts his apprentices' names on the back of his paintings, thinks he's found the ideal arrangement. His Indian assistants "all get salaries and they get bonuses," he says. "They earn much more money than they would from the tourist trade." In a telephone interview, Mr. Uddin, Mr. Gorlizki's chief assistant, said that Jaipur has about 3,000 painters, and almost all of them churn out traditional Indian paintings for the tourist market. Most of them have little interest in pursuing their own creative artistic careers, he says. Mr. Gorlizki "is a great artist," Mr. Uddin says. "I'm happy with the way it is."